Breakfast is served in the Slí Dala Restaurant, located beside Reception, between 8:00 a.m. to 10:00 a.m. daily. The menu is an option of continental or full Irish Breakfast (cooked to order). Lunch is served daily in the bar from 12:00 p.m. to 9:00 p.m. Monday through Saturday, and from 12:00 p.m. to 8:00 p.m. on Sunday. Dinner is served in the award-winning hotel restaurant, Slí Dala. 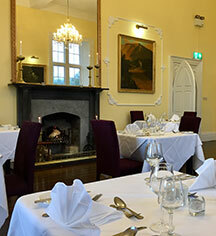 The warm ambience of the Slí Dala Restaurant offers an elegant fine dining experience, with gourmet dishes under the expert guidance of Executive Chef Mark Conneely. This well-appointed restaurant offers guests the perfect setting to enjoy a candlelit evening, overlooking beautifully manicured gardens with friendly four-star service. The Slí Dala Restaurant is open from 6:00 p.m. until 9:00 p.m. Monday through Saturday, and from 6:00 p.m. until 8:00 p.m. on Sunday. Afternoon Tea is available between 3:00 p.m. and 5:00 p.m. daily, serving a selection of scones, finger sandwiches, and mini seasonal desserts. Advance booking is required. 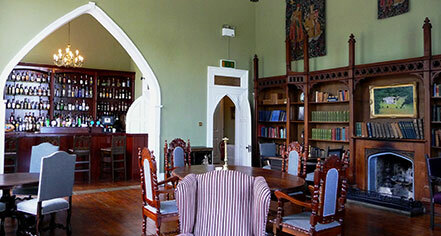 The Library Bar is open daily, serving a coffee and snack menu from 10:00 a.m. until 9:00 p.m. Hours of food and beverage outlets may vary depending on the season.